In my mid- to late-teens, I started reading the Bible. I tried to develop a habit over time of reading just a chapter a day, looking at some particular point or lesson in that chapter, and reflecting on that chapter. I’ve gone through periods of success and failure with that. And I think that’s the humanity of trying to establish any great habit in our lives. The last thing I want to do is sit here and pretend that all of this stuff that I’m talking to you about is stuff that I’ve mastered, because that absolutely is not true. I think that the people who get to be around me every day, the people who know me, would tell you that. I’m struggling with this stuff as much as you are struggling with this stuff. And one of the things that I really have struggled with over time is to keep this habit of just reading the Bible for a few minutes each day. When I’m reading the Bible regularly, when I’m reflecting on the Word of God in a meaningful way, on a regular basis, I just tend to make better decisions. I’m a better decision maker. When you think about how important decisions are to the foundation of life, how our decisions affect who we are and where we are today, and how our decisions will affect who we are and where we are a year from now, ten years from now, and beyond . . . making choices is one of the great building blocks of great lives. So we should be constantly honing our ability to become phenomenal decision makers. I think it’s a great theme to explore the Bible with: Who made great decisions? Who made poor decisions? When was the same person making their best decisions, and when was the same person making their worst decisions, and what was different in their life at those different times? Are you a good decision maker? Do you feel like you’re a really good decision maker? Do you feel like your yes is a strong, passionate, purposeful yes? And do you feel like your no is a firm no? Or do you feel like you say yes to some things for the wrong reason sometimes? It’s an extraordinary thing. The point is, we say yes to a lot of things for the wrong reasons, and we say no to a lot of things for the wrong reasons, and God wants to rectify that. He wants you to become a phenomenal decision maker. So here, the practical takeaway that you can start living right now, today: Read one chapter of the Bible each day. For how long? For the rest of your life. And on days when you’re struggling to do it, force yourself to do it. Break through resistance. And offer it for me, so that I might do it that day, because I’m probably struggling to do it as well. People who regularly read the Bible make better decisions. Set aside a few minutes each day to read and reflect on a passage from the Bible. Begin with Matthew, Proverbs, or Psalms. God, I know the Bible can give me incredible insight. Guide me as I read your word. Today’s personal reflection features Dynamic Catholic team member Brian Florin. Brian is one of our mission partners, coming to us from Granger, Indiana. Brian writes right-handed but plays sports left-handed, listens to hip-hop music from the 2000s on a regular basis, has attended a Taylor Swift concert, and enjoys long walks on the beach. 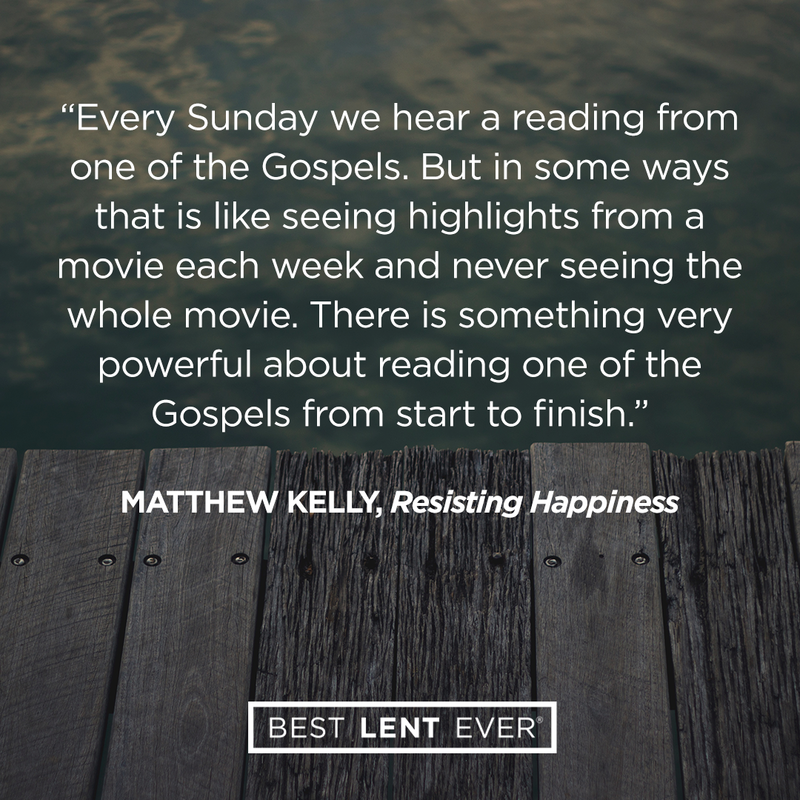 Is there a story in the Gospels that has inspired you?